Hope this is readable. 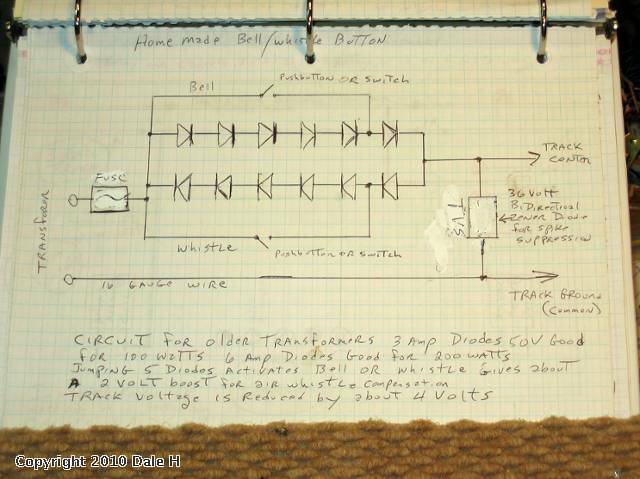 See my post for "Homemade bell/whistle controller " in the electrical section for basic circuit.The following will compliment and automate it using relays. When a train runs over an insulated rail section approaching the crossing the whistle will sound in sequence Long,Long,short,then long. The bell function can be automated in a similar fashion. 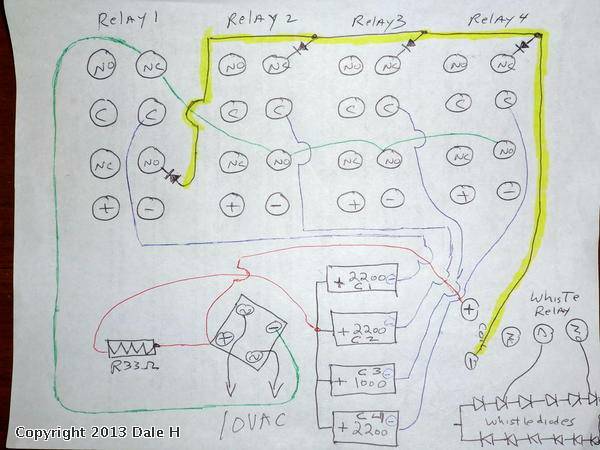 The first diagram will sequence 2 or more relays without expensive timers or 555 circuits. For the 4 relays in this example,The left contact sets of relays 1,2 and 3 are used to accomplish this. It has more uses other than just the whistle sequence. Other accessory application examples using 2 relays: to time a block signal from yellow then red, turn off a crossing bell or semaphore or gate man after 1 to 10 seconds. Any momentary contact circuit. Note that the power source (transformer) 10VAC for 12 volt relays or 18 VAC for 24 volt DC relays DOES NOT share a common with the track. Instead the minus of the bridge rectifier does. The timing varies with the type of relay and capacitor values. For the one used in this example NAIS SP2-p about 1000 uf equals one second. 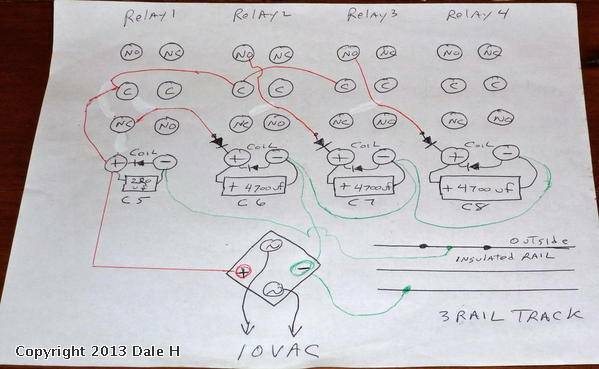 In operation relay 1 is normally off, Relays 2,3 and 4 are normally on powered by the preceding relay contacts. When the train wheels complete the circuit to relay 1 coil power is removed from relay 2 but relay 2 coil does not de energize until capacitor C6 4700 uf 35 volt discharges,about 5 seconds. C5 220 uf is for anti chatter. The diodes into the + of coils 2,3,and 4 keeps the capacitors from sharing. Note the contact sets are reversed on this particular relay due to the fulcrum design. The next diagram uses the right contact sets of the same relays 1,2,3,4 drawn in another diagram for clarity with the 1st diagram circuitry omitted. the power supply is the same one as in the first diagram. The right contact sets discharge a respective capacitor into the whistle relay coil,it's contacts used instead of a push button described in the earlier post. 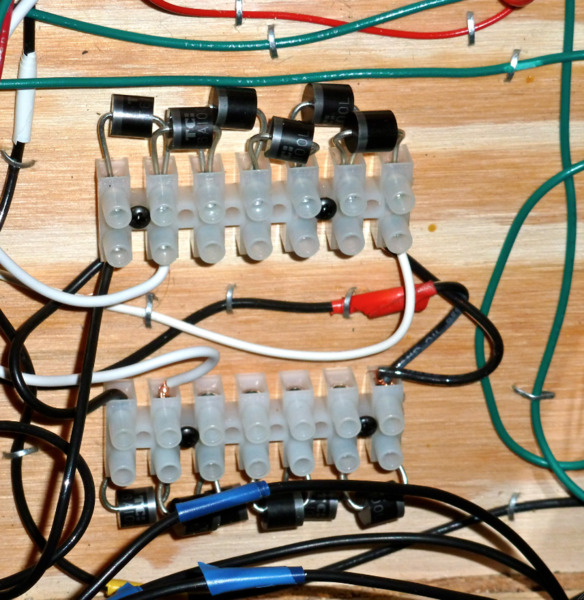 The contacts bypass 5 diodes on one side of the string which sounds the whistle (or bell depending on which side is bypassed) When relay one is open C1 is charged through the NC contacts as it is connected to the minus of the bridge rectifier. When relay 1 closes, the minus of C1 2200uf,35 volt is disconnected from the minus of the bridge and connected to the minus of the whistle coil where it discharges into the whistle relay coil, energizing it for about 2 seconds. The contacts of the whistle relay bypass 5 diodes in the string sounding the whistle. In a similar manner relays 2,3,and 4 discharge their respective capacitors but with the contacts reversed. C3 is 1000uf and holds the whistle coil for 1 second for the shorter blast. If this is too long for taste,a 470 uf one can be used. In fact all capacitor values can be experimented with to suit to taste. Due to the nature of capacitors they do not always react the same each time so this is not precision timing. So combining the contact sets,when a train occupies the insulated outside rail section,the whistle or horn is sounded long,long,short,then long. Similar type circuits can turn a bell on or off for engines so equipped. The 33ohm half watt carbon resistor slows capacitor charge just a bit to slow inrush current so as to relieve sparking on contact blades. 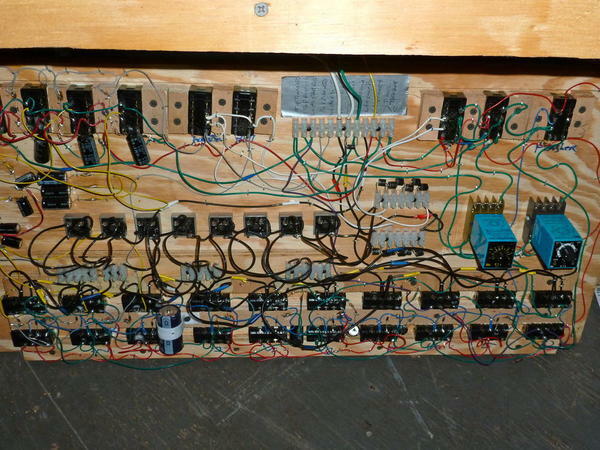 The diodes keep capacitors separated. 1n4001-1n4004 are sufficient. 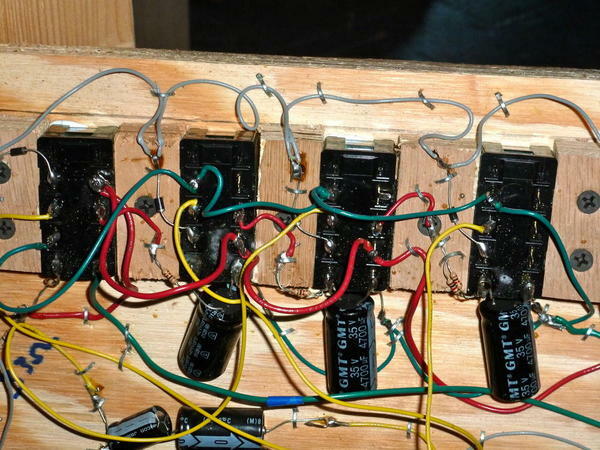 Any bridge 4 amp or more is fine.